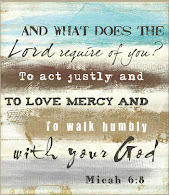 A Very Blessed New Year to everyone! But today my post is the continuation of Our Travel Journals - you can see Part 1 here. We have adopted various documenting approaches over the years, I hope by sharing that you might get an idea or two! 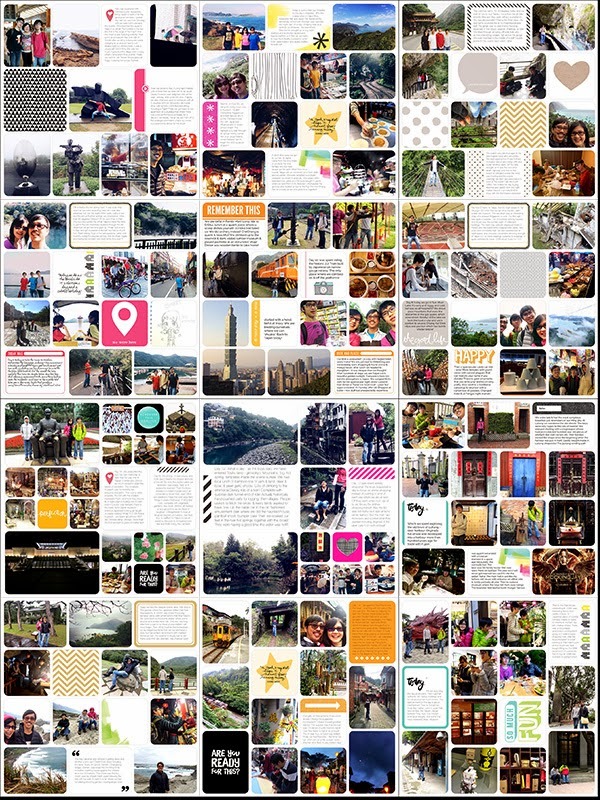 Since 2012 when I started Project Life, I have been using it to capture journaling while on the trip itself! For this Beach holiday (see this post), I pre-designed/printed my own journal cards, and wrote on the beach, at breakfast, and everywhere, and came back with coffee stains and sand on my cards. Most authentic, haha! 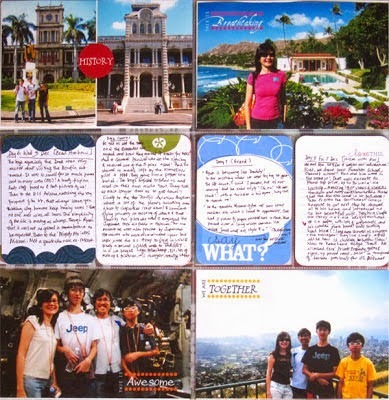 For our Hawaii trip you may remember this post, where I shared how I brought along Becky Higgins journal cards and a few pens and journalled everyday. It is really great with these cards, so light and convenient to carry around, and so quick for jotting down first impressions, thoughts, 'famous last words', on the spur decisions, even mistakes, adventures and so much more! 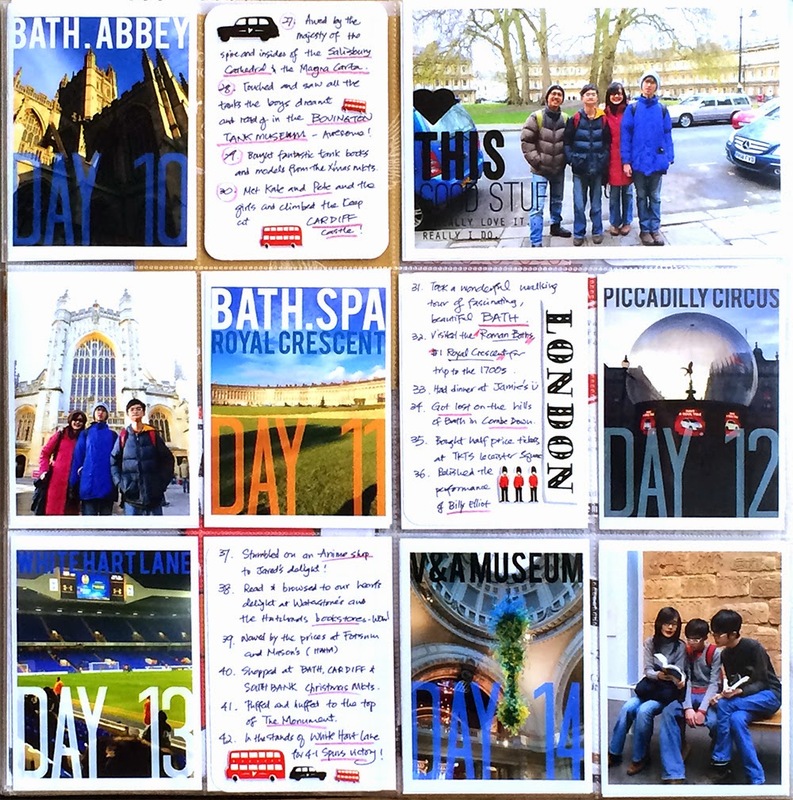 When we got home, I simply printed a photo for each day of the trip, slot into PL, and our trip has been captured! 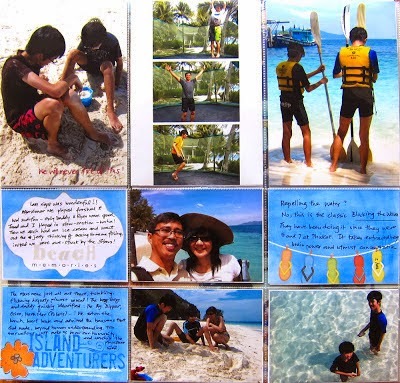 Of course I went on to do a full photobook for all the tonnes of photos, for which I referred back to these cards to remember the trip for more journaling in the book. For our once in a lifetime trip to London (see this post) though, there was just too much to capture each day, so I went back to journalling in a notebook. Instead, for our PL, I made a list of our top 50 seen and done in London - on blank cards adorned with stickers - and popped them into PL - loved the result! See that post also for more on how I used Rhonna Designs' App to create the Day marker/Title cards. 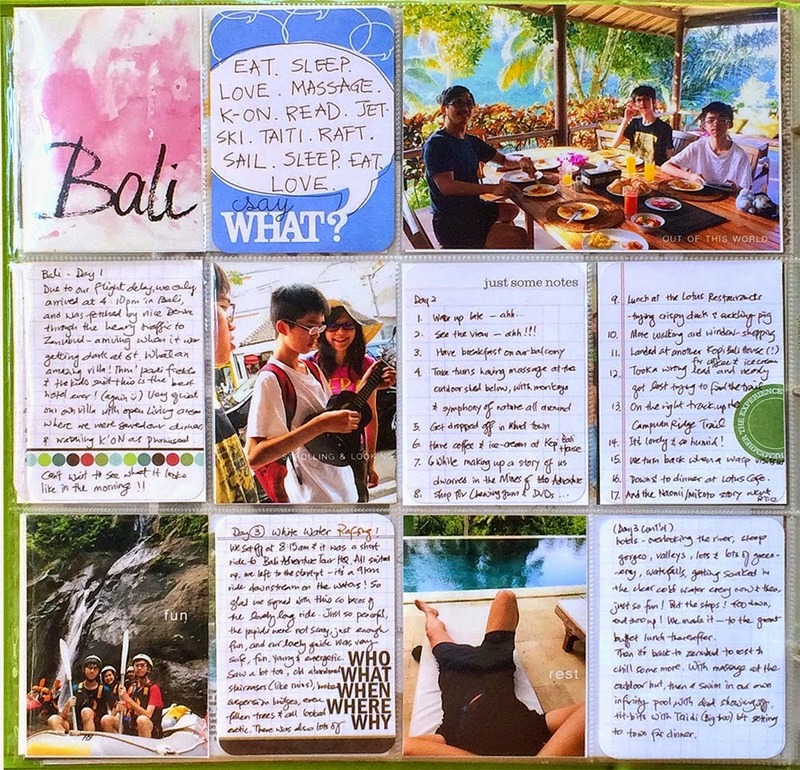 As for our Bali trip, I went back to day by day journaling. My family has gotten used to me and my journaling and usually offer an idea or two and say, "you should write that down" ! 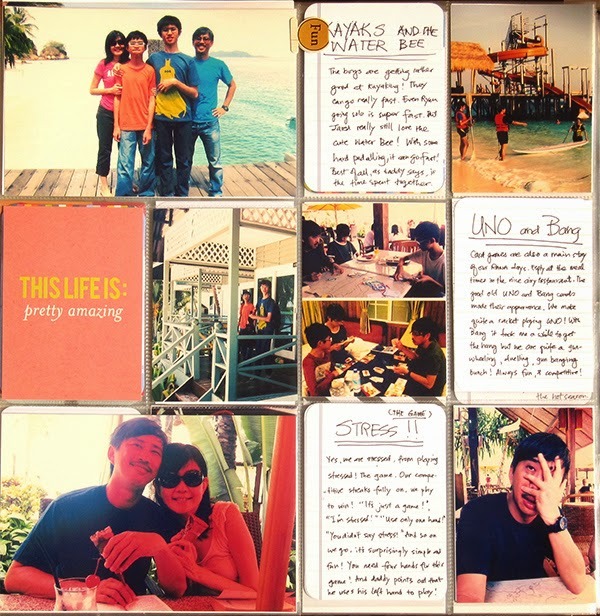 You can tell how much I love this PL journal card way of capturing memories on our trips! 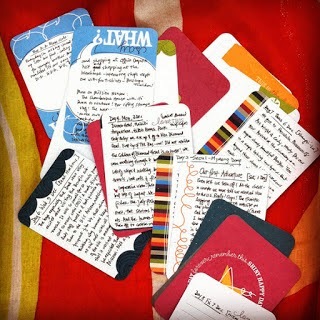 So bring some journal cards and a pen in your purse on your next road trip, holiday, and try this! But now that there is the Project Life App, I have jumped on that wagon and for on our most recent holiday in Taiwan, I journaled and made my PL pages with the App on the trip. Here are the 12 pages I completed before our plane touched back down in Singapore - summarizing and capturing the 16 days we were there - I am so happy with this approach! There's another reason why this turned out to be so important, but I'll share that later. I am sending these to Persnickety to be printed in 12x12, and will add them to my PL album. I also plan to add some physical elements to them just for the fun of it. Will share these in the upcoming post! 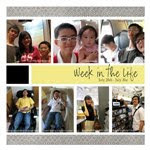 Then there are of course, our travel photobooks. 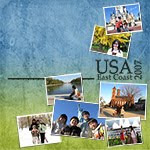 The first I made was in 2007, of our epic US East Coast trip, which practically marked the start of Yin Designs templates!! 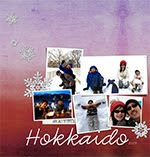 I continue to love making photobooks of all our holidays this way, and have never thought of doing them any other way. Links to these photobooks are towards the bottom of the right side bar, if you want to take a quick look. 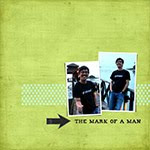 I have also shared templates of my photobook covers - also linked on right side bar. I realised I haven't posted my most recent completed books - for Hawaii and Bali. Here they are. For Hawaii, I adapted the layout I already made (template 336) to become the cover, by adding a green strip - making it look like a binding. 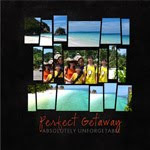 For Bali, I was in a rush (to catch 50% off) so simply enlarged an awesome photo and made it the cover! I'm still using Shutterfly - I'm so familiar with their software I don't really want to bother with trying other printers - though I've heard so many other great reviews. Their quality is great enough in my opinion still! 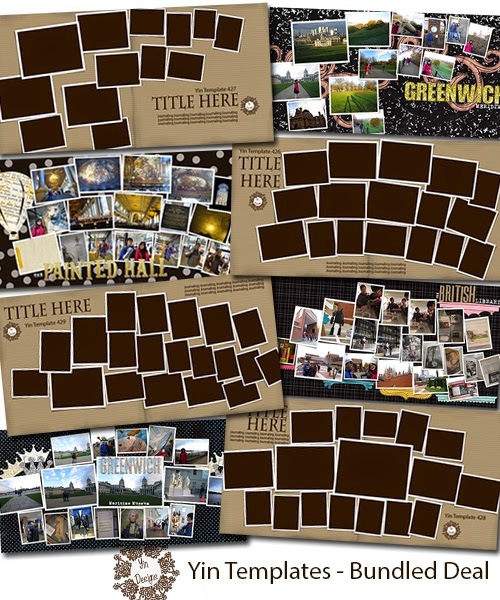 And I have completed four more pages using the artsy and quirky backgrounds I had created for London. This round all four pages have dark patterned backgrounds nothing like the solid backgrounds I usually use, but making for very interesting and quirky layouts, hopefully you agree! On day 2 of our trip, we had taken a river boat down the Thames to Greenwich, and spent a glorious day there. 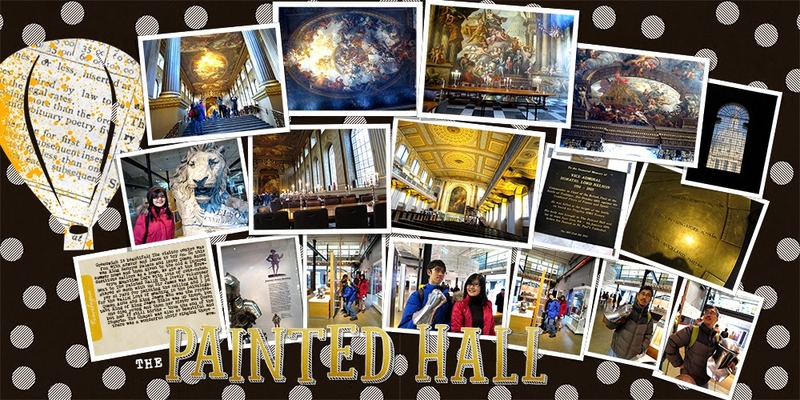 At the Painted Hall, we were treated to the beautiful hall, and to fascinating stories and histories through the paintings, because we walked up to a volunteer and simply asked. He was so wonderful and eager to share his knowledge with us. 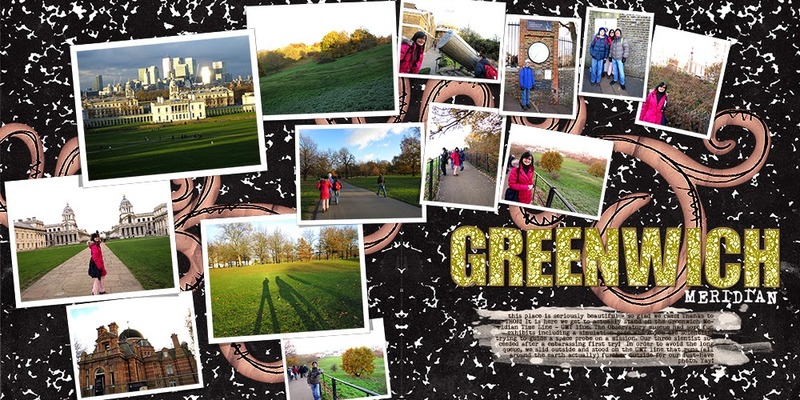 It was a beautiful day and Greenwich's landscape was lovely as we took a walk up to the Observatory and the Greenwich Meridian Time line. It was on a whim after watching the Thor movie (in which Greenwich was destroyed!) 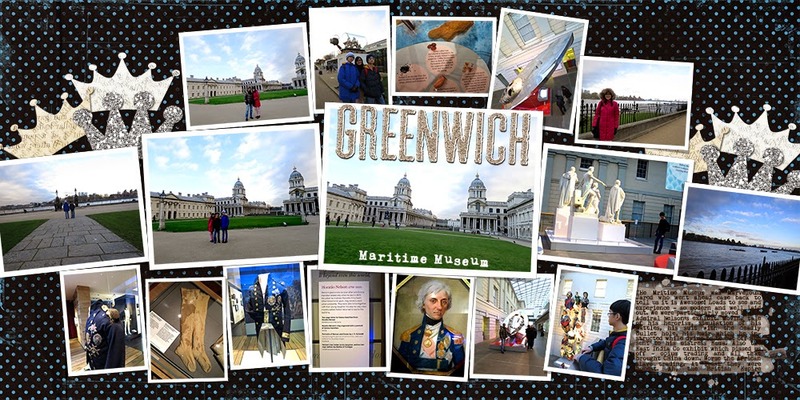 that we decided to visit Greenwich and we don't regret it. It was also here that we started on our journey in the footsteps of a giant - Lord Nelson - learning about this hero in the Maritime Museum - the coat he was wearing when he was fatally shot 200 years ago is preserved here - you can still see the hole made by the bullet.(gasp). The museum itself is really cool too - the boys will attest to that. 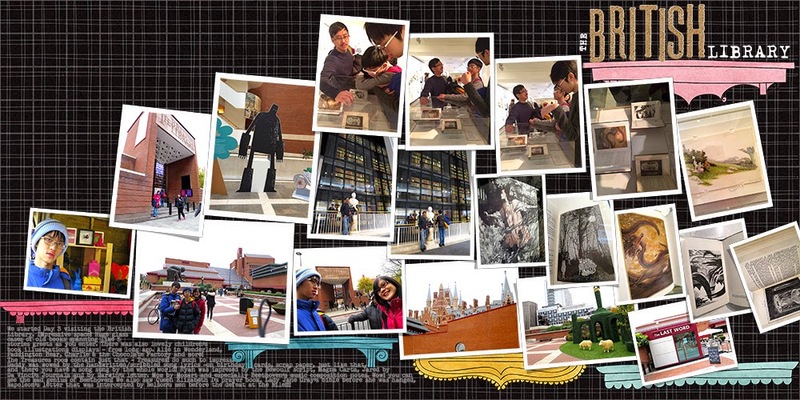 On day 3 we started the morning by visiting the British Library - a most amazing place. We were completed floored by the Treasures - books, journals, scripts, written words beyond expectations. Dh was captivated by song lyrics scribbled by The Beatles (birth of songs we all know! ), me by Mozart and Beethoven's handwritten scores as they composed, oh my! Jared by Da Vinci's sketches in his journals, Ryan was impressed by the Bewoulf manuscripts. There was even a letter wirtten by Napoleon that was intercepted by Nelson's men - possibly causing Napoleon's defeat at the Nile(!) How cool is that? I really like this layout, which turned out looking like books stacked on shelves, don't you think? 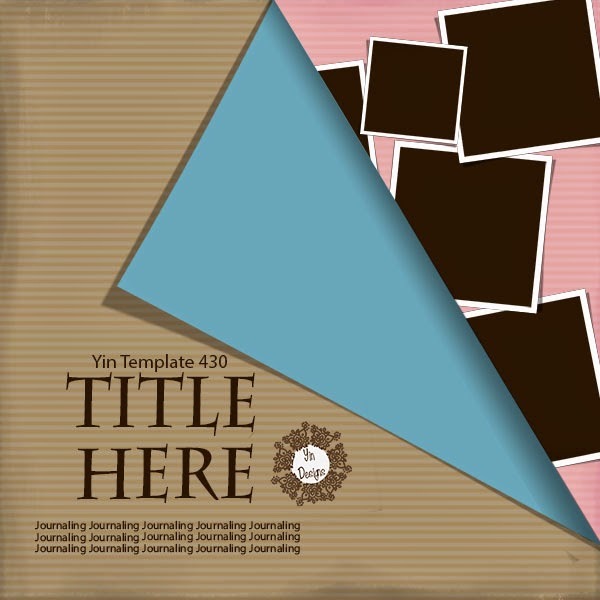 And the set of templates are available in the store here. thanks for looking! 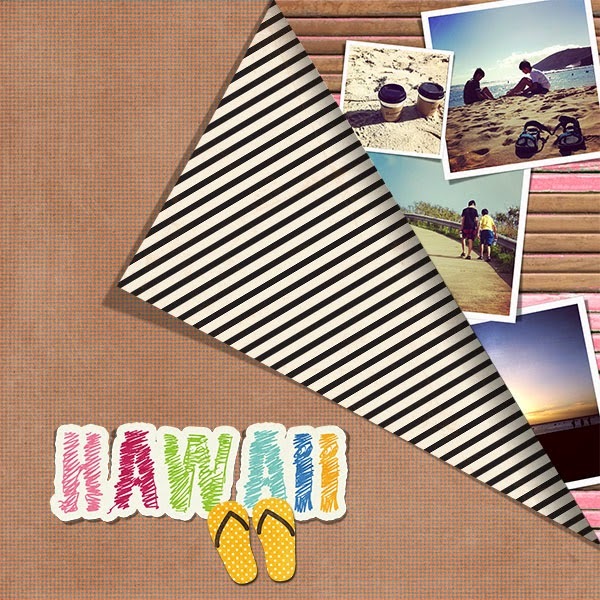 Finally, here is a page I made for the first page of my Hawaii photobook, by adding a flipped over page to a layout I did with template 339. It is fun finding papers for the 'front' and 'back' of the 'flipped page'. Hope you have fun with it! And that folks, is how we do our Travel Journals! Would love to hear how you do yours! Love your London pages! 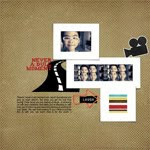 I am always amazaed how you can fit so many pictures on your pages and make them look so great. Thank you for the template. I like the idea of having a flip page on the cover. I never treid that before, but it might be a good effect. Your albums are beautiful ... thank you for the freebie!